did this awesome picture of Martha from Martha Speaks: like, WOW! It's so lovely to receive mail. And when it't this gorgeous, you hang onto it forever! Unknown artist who ARE you? This ravingly gorgeous pikkie was sent to me by the ravingly gorgeous Joshua Heck. Whhhy is it so so endearing??? I signed for them but they didn't sign for me! 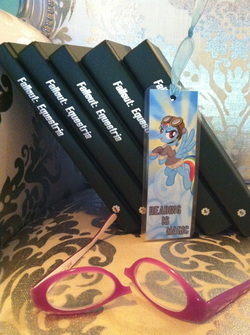 A bunch of enthusiasts; Joseph and Dylan Smith and another lad bought me these a copies of fanfic "Fallout Equestria"-- by 'Khat" Blisteringly popular among the bronies I have had to fight my nieghbor's kid to repo the 5 volumes. FIVE VOLUMES. Can you say "prolifilc???" http://catwhitney.deviantart.com/ Who rocks Deviant Art. 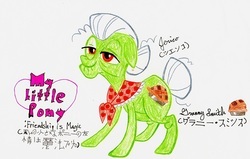 Handed to me at everfree NW Con, here's a terrific portrait of Granny Smith from MLP by "Jericho"
gorgeous plushie which I keep on my mantel. This was given to me by a girl at Everfree NW Con. -- two of my pony characters as humans or fairies. It's hard to read the signature but I think it says 'Hannah Ambruso"-- anyway. I love it. This also came from Everfree NW and again the signature is quite hard to read but I believe it says: Chain Chong 7. This is three of my MLP characters -- I love the one n the treasure chest! 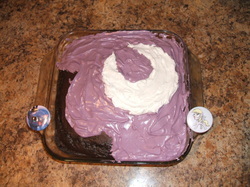 From the" D.C. Bronies --" Note the moon and the three diamonds for Luna and Rarity. What a thing of splatty beauty. 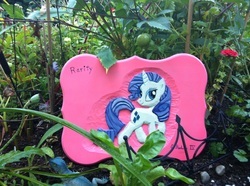 carved this image of Rarity on wood. Mad skills. Mad. Skills. Again, unsigned, this delightful painting on canvass was given to me at Everfree. If you are the artist, let me know so I can give you credit! scarves! Such a beautiful gift. A girl, again, I don't have her name, but I think she was from Winnipeg, passed on a stack of comfy scarves all emblazoned with our characters' cutie marks. 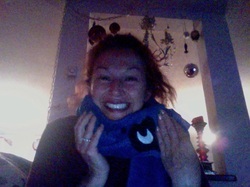 This is my Luna scarf. My fave. Thank you lovely unknown girl! 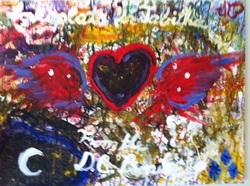 A girl at Anme Vegas gave me this lovely panting. If she sees this write and tell me your name! 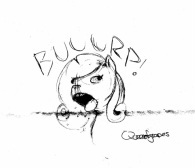 It was wedged into my Everfree program from last year. Makes me laugh. This is a rendition of me (as my characters going into Ikea and setting all the egg timers to 5 minutes (which I had put in my bio) Awesome! ... I have a bit of a silly question to ask of you. Some of my feetle planes are divinely protected. They've been assigned their own ninja angels. I speak of the heel and the ball. You can deploy ostrich feathers, one liners and solar flares and not get a jot of response. There have been commando parasites sent from Zeta Reticuli to infiltrate my feet and they've been send packing roundly, with their vestigial tails up their conundrums. That said, to this day, the base of my toes cannot resist a good pun, iridescence, or squishy red mud. ...Tabitha... whats with Canada and fart jokes? Even Ashleigh Ball in a MLP interview mentioned you guys just crack fart jokes all the time, is the whole cast of MLP all about fart jokes? Its insane? That's a good question, dad. I guess we're all about sound. And involuntary sounds have a special places in the toon lexicon. Consider all the falling down, getting hit, freaking out sounds that are the staple of any animated thingy. Try this: Record as many people as you can find all in a row making raspberry sounds. Then play it back a few times. Anything? If not, hate to break it to you, but you may be dead. (And even the dead sound off, I understand.) I did read that in Malawi pooting was actually outlawed briefly.http://www.bbc.co.uk/news/world-africa-12363852 --There was an outcry, as you may imagine, anatomies being what they are-- things we all have. Billions of us. All embodied, all animals, however lofty our minds. However, there is Malawi. At least one refuge for those who feel that off-gassing is a matter to... er... tighten up on. ... Heart. Yeah. That funny lump. Just went all glowy. As you probably know, there's an election coming up in the US... and I'm not terribly fond of most of the candidates. 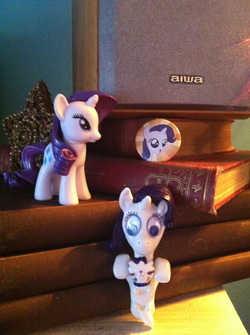 So, I'm thinking of writing in Rarity. Now, hear me out! 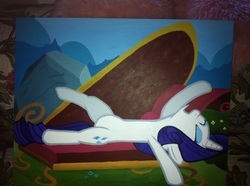 Rarity has the element of generosity, but moreover, she knows when it is appropriate to actually be generous. She doesn't like to waste things. She wouldn't spend spend spend tax payer money like a crazy pony! We could take care of the less fortunate people living in our country, whilst cutting out all of that waste. That's just win-win! 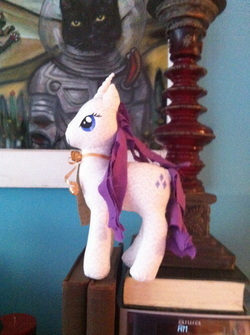 Rarity also aspires for greatness in everything big and small. She wouldn't allow the country to settle for 'the best we can do at any given time'. She'd strive for what pride and dignity demands! It's also helpful that she has the unique ability to find gem stones. That would be a grand help for raising funds at any given time. She'd also be able to sense whether or not other sneaky politicians were sneaking some of those gems in offshore bank accounts, I reckon! Last, but certainly not least, she is a wonderful orator! 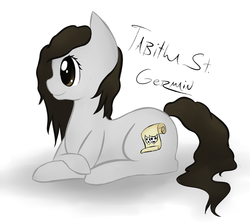 ( ;D ) She could inspire everypony to be the best that they could be. To never let anything get them down... to know that our government has always got our backs! Applejack could be her vice-president, since she has that down-home folksy charm that a lot of people love. It would be fantastic! ... if only she weren't from a foreign land... not of age... and, perhaps, not being a human might be a hindrance, as well... Hrrrrm... Oh, well, I still believe in her! "As your president I vow to put an end to the odious practice of putting stickers on fruit!" Said James: Rarity/Applejack 2012 - A Fruitful Choice! P.S. even though it's not technicaly my b-day, I'm open to celebrating all year. I consider the year my birthday SEASON in order to maximize cake and goodies. As I told one lad, I regularly remind my circle how many shopping days left until my birthday. That way people think they must like me because it's always on their mind to buy me pressies! Bwah-HAHAHA!!! (that was a Nightmare Moon laugh.) Wikipedia, IMDB. -a bit spotty. Be well boo. Hm. What an interesting question. Do I inject my own personality into the characters I play? Well, probably, since I am, after all, me, and it's very hard to get away from myself although there have been occasions when i have tried. On the other hand the real fact is that we are all one big being experiencing life. So in a sense, I am also everyone else... So Ricky, it's quite possible that when I act I'm actually being you. Now who in the world said I was quirky??? everything seems quite normal from inside here! To the owner of the most excellent voice and sweet disposition, many thanks for all the tops entertainment over the years. You brighten up the place immeasurably. I Have a video tribute made out of your hilarious website bio! Thank you for saying I have a sweet disposition. Could you mention that to mum? Post-Industrial Sausage(!) writes:Hi Mizz Tabitha! Anyway, between the show itself and the videos and messages I've run across from assorted staff involved with the show, I have to say that all involved with the show, from writing to animating to voicing, are among the most deservedly beloved folks in the industry right now. Here's to many more episodes of awesome. Dear P.I. Sausage. You are too, too kind. None None writes: Hi! I'm a huge fan of Tabitha's incredible talent and command of her voice. She breathes life into so many different pieces, and it always brings an artistic touch that always elevates a show when I hear her work. I'm writing because I really think Tabitha more than deserves commendation for her work. 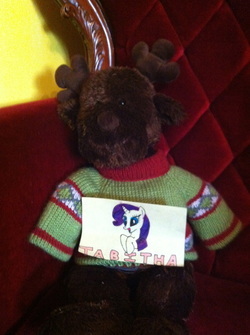 Is there anything fans can do, people we can write, and so on, to help support Tabitha? For example, can little people like us do anything to promote the idea of her getting an Emmy or something like that? I don't even know what kind of awards are even out there, but I know she deserves them! Dear None. Dear, dear None. What's to be done? It is very very kind of you to offer to prop up my career. But not to fear. I've put toothpicks in several places and some chewing gum(well masticated) in one or two key joints. I also sacrificed a chicken(well, tofurkey,) to the great BINGBANGBOOM, Raccoon God of artists(and thieves). So I do feel moderately secure. I have on occasion considered asking politely if I could have an Emmy or two, but my agent says that while that might stand in some parts of Canada, it will hold no water at all with the feisty lot to the south. Nonetheless I am extremely touched by your offer. In return I'm going to send the Everythingawesomeandandthencake Fairy after you with her wand. Do be careful of the bridge of your nose for the next few days because she can give one quite a bonk. So far, I'm not doing too badly for wishes. However, should you ever come across a spare one, I would certainly like an island. With gooey fondness that knows no bounds -Tabitha. I wanted to write to you and tell you how much your work has meant to me. ...I came across the show, and was sure I would hate it. 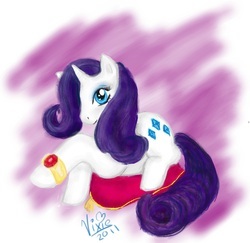 Curiosity got the better of me though, and within one episode I was hooked!...Rarity is my mascot and my inspiration. I have a screencap from "art of the dress" as the wallpaper on my phone to remind me that fashion is difficult sometimes, and that I should stick to my guns about the things I want to make. (that episode is tied for favorite with sisterhooves, and Spike's birthday) I feel very lucky to have Rarity as my guide. (And Twilight to remind me to study, and Pinkie to remind me not to...)Your versatility as a voice actress is amazing! Oddly enough, I happen to adore Martha Speaks too, and I had no clue you voiced Martha as well. Thank you for bringing these characters to life so wonderfully. Oh sweetheart. How beautiful you are. Thank you. Дмитрий Колесов writes: I am a big fan of your work in general and your anime dubbing efforts & your work on MLP:FiM in particular. I am sure I would never appreciate the characters you voice as much if it wasn't for your amazing talent...Hallo you whose name I can't read! Thank you very much for you letter and your support. Also, Rarity is best pony.Thanks, Angel. I'm sure you've been getting this a lot lately, but you doing ___ voice was amazing and adorable. :) loved it. When I heard ____ voice, my mouth literally dropped for about 5 minutes. Well, I just thought I'd stop by to say hi and wish you well. You little blast of pure sun. Always, always welcome in my heart. Love the Christmas pic. Love it. Ed M. writes:....thankyouthankyouthankyouthankyou for the great job you did on voicing our beloved ____... the moment Dash (er- Ashleigh Ball, that is) said ____ I couldn't quite believe I heard right. And when ____started TALKING?! Well, the whole thing made my day. And every time I watch the scene (and I certainly have been re-watching it!) I can't help but smile- not just because of what it represents to the fandom, but because of your performance- the voice really fits her personality perfectly, just like all the other voices you do on the show. ... you and the rest of the wonderful cast really are the heart and soul of the show- it just wouldn't be the same without any one of you, and I just wanted to thank you for all the great work you put in on it. Of course the great work the animators, writers and rest of the crew do is vital, but great looking characters, even if well-written, simply aren't alive until the cast makes them so. Crazy and strange as it may be, your work is really making a difference in lives- mine just being one of them. Thank you so much for that. PS- Whatever you do, don't get discouraged by the neigh-sayers. That would be a bad thing. I daresay the worst thing. In fact, of all the worst things that could happen, that would be the WORST. POSSIBLE. THING! You lovely duck, Ed. Neigh-sayers indeed. hahaha. 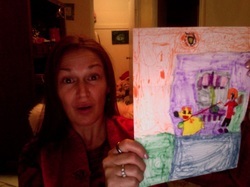 Hello Ms. St. Germain,I am a huge fan of your work!I've been absolutely charmed by My Little Pony: Friendship Is Magic. I just expected to to be another Flash cartoon, but it somehow captured my mind and my heart, and put a huge smile on my face and lifts my heart. I have no regrets. :)I must say you have amazing talent and range. I love how you put your all into any character you do! 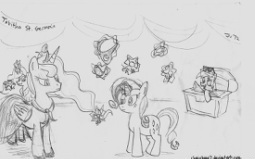 I love how over-the-top Rarity is, how loony Granny Smith is, and how awesome and awkwardly sweet Luna can be. My wife and I just love what you do your voice. It sounds like you have an amazing amount of fun! Truly, all of the voice talent on the show is just fantastic!I was absolutely floored when I saw the latest episode! .....most wonderful and unexpected surprise... I thought ____ was simply adorable!Thank you so very much for lending your amazing voice to this truly magical show. I really and truly cannot imagine your characters voiced by anyone else. Dylan R. writes:...The voice you came up with(for ___) was absolutely adorable. ...So I want to say, we love you and the work you do. 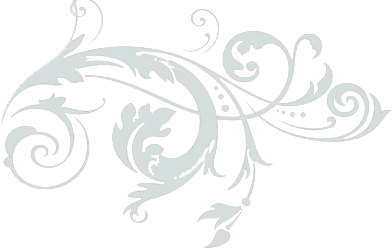 Please keep sharing your wonderfully talented voice with us. ...back atcha Dylan. Thanks for you kind wishes. Everything's fine here. No worries. I've only met you all on the net, but let me say, I've never met a brony i didn't like. Buckets of love, and all of it welcome and appreciated. Be well, angel. As I said to... er.. someone... can't remember... I think you well wishers a forming a little forcefield of harmony, as it were, over my little cyber hut. Justin Morgan writes: You're great ! My friends and I wanted to send you emails to show that we truly appreciate you voicing ___ and all your characters for that matter. Well, I think you're great. I'm getting so much praise I'm going to have to find one of my buddies and get myself roundly insulted just for balance! I just want to send you this mail as a response to My little pony: friendship is magic's latest episode in which there is a scene regarding the now officially recognized ___ Hooves. I just want to say that that scene made my week, it was amazing and funny and it was amazing to see how developers of a show react to their accidental audience, thank you for that! Nick from Ohio writes: You have given our ___ her "royal we" and have provided fantastic voices for our favorite pony characters! I really love your voice for Rarity - its genius - and the spectacular work you and all the cast have done on Friendship is Magic has helped me personally so much to alleviate the stress associated with upper level engineering courses here at Ohio State University. I never would have believed it if someone in the past had told me a series I used to watch with my younger sisters at the age of 4 would be a source of mirth and entertainment for me today. I remember years ago when I was in high school I watched the show Krypto the Superdog in which you provided one of the voices in that show and I thought it was spectacular as well. Keep up the good work! I'm such a fanboy! Thanks Nick. And brave soul for respecting yourself enough to like what you like. it should be a no-brainer, but sometimes people subdivide! I'm constantly surprised by how many men love MLP, (even marines!) and it proves something I've always believed: that innocence is finite. It's not something that can ever go away despite what a person does or has done. -- be well, Beauty. Hey V. Thanks for all this nice stuff you say. Like, shucks and everything. But listen, more the the point, how awesome are you? I looked at your deviant art stuff and it's just fantastic. You are an aggregate of talented little cells, my bunny. Thanks James, I like voicing Rarity too. I mean where IS she from? have you heard her mom?-- T-pot. Thank you, Andrew. That is very well done. It could easily be one of the animation cells. I wouldn't be surprised if you ended up as an animator! -- Have I mentioned how ADORABLE you are? Thank you Brittney. You are very kind to say all that nice stuff. You are 12 different kinds of awesome. Thanks Kimmie! I can't believe how beautiful your drawing is. And such gorgeous colors. You are an outstanding artist! Thank you! And me and Martha love you too! Dear Glen. Thanks and does this answer: GO CANUCKS! Happy Halloween to the voice of Martha the Dog on the cartoon series "Martha Speaks" It airs on PBS kids in the USA and CBC kids in Canada?-- Darryl Heine. Inverness Il. Thanks you Darryl. I still have both your cards. What wonderful writing. --Much love, Tabs. Until a few days ago, I had no idea of who you were. I was surfing on the web and I came across some chapters of The New Addams Famiily. I imagine it was quite a challenge to do a remake of such a successful series.I saw three chapters where you performed. I enjoyed your performances both as Melancholia ("the unmarriageable niece in the Addams Family", as Hazel Shermet, your predecessor, defined her) and her sister Catastrophia. If I'm not mistaken, Catastrophia didn't exist in the first version.I read your biography and visited your web page and I see now you're working mainly as a voice actress. I wish you the best of luck out there. I'm Argentinian and I teach English and French as second languages. I also have a web page through which I contact teachers and translators with prospective clients. Once again, congratulations on your work and good luck. Best. Carlos, you are obviously prodigiously gifted with language. Thank you and best to you too! Hello, Ms. St. Germain. 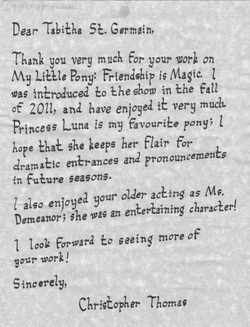 I am writing you today to pass along my appreciation for your voice acting in the current Hub show My Little Pony: Friendship is Magic. Your superb acting as Rarity the unicorn is - in my mind - a tremendous boon to the show, and I know that a large portion of the fanbase has reached the same conclusion. 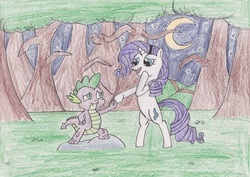 You are doing an excellent job at injecting Rarity with a vivid and enjoyable personality! She really comes across as not only a brilliant and glamorous designer but also a genuinely friendly and insightful pony. I'm really looking forward to seeing more of her in Season 2 of Friendship is Magic. Your fellow voice actresses Tara Strong, Ashleigh Ball, Andrea Libman, and Cathy Weseluck are also performing exceedingly well as the rest of the main cast! Please pass along to them the esteem that the MLP:FiM fanbase holds for their voice work. All in all, the voice acting on the show stands out as quite professional - and highly enjoyable! Honestly, Ms. St. Germain has won a sizable number of fans due to her portrayal of Rarity, and we all would like her to congratulate her & offer our best wishes for her continued success. Thank you very much~! Thanks for your lovely card Mike. And I do solemnly vow to only use my power (the power of silly) for good.